Catalans overwhelmingly approved a referendum to separate from Spain on Oct. 1, 2017, but they are no closer to independence today than they were a year ago. Add Spain as an interest to stay up to date on the latest Spain news, video, and analysis from ABC News. "It was a real vote," waitress Paulina Pujol, a 24-year-old Catalan, told ABC News. "We simply wanted to say peacefully that Spain needed to accept the reality." But Spain had other ideas, refusing to recognize the vote in the autonomous Catalonia region even as the pro-independence movement keeps growing, according to a recent poll cited by pro-Spain newspaper El Espanol. The SocioMétrica poll found that 51 percent of Catalans support independence and 53 percent of them believe it will eventually happen. 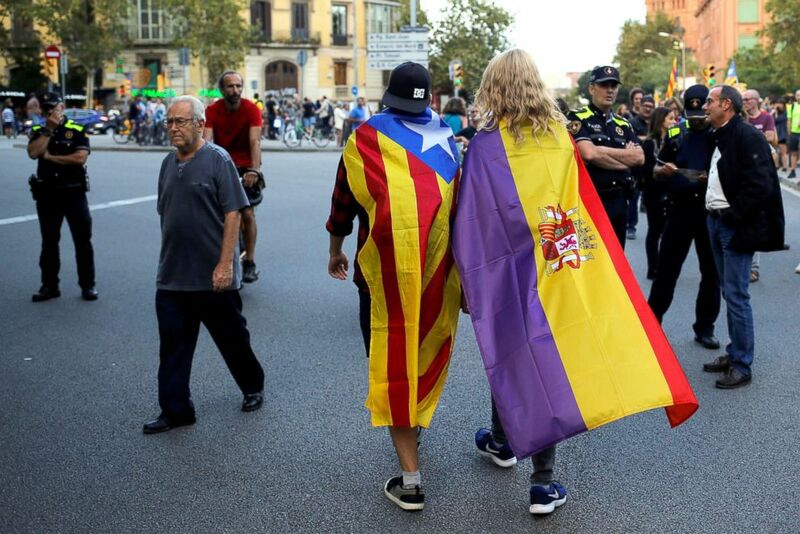 Protestors wear flags during a demonstration on the first anniversary of Catalonia's banned referendum on indpendance in Barcelona, Spain, Oct. 1, 2018. Spain has always considered the vote illegal, however, last year using Article 155 of its constitution to stop the secessionist attempt by dissolving the Parliament and calling for new elections after taking control of the institution. Many separatists are undeterred, even as some leaders of the movement remain jailed or exiled a year later. "Last year, Catalans people proved to the world and to ourselves that we can win," Adria Alsina Leal, 36, a separatist activist who is running in primary elections for mayor of Barcelona, told ABC News. "Even if it was for a short moment, we did it. We proved to Spain that we are here to make respected our rights for real democracy. This fire is still alive." A demonstrator holds up a banner reading "Freedom" during a demonstration on the first anniversary of Catalonia's banned referendum on independence in Barcelona, Spain, Oct. 1, 2018. 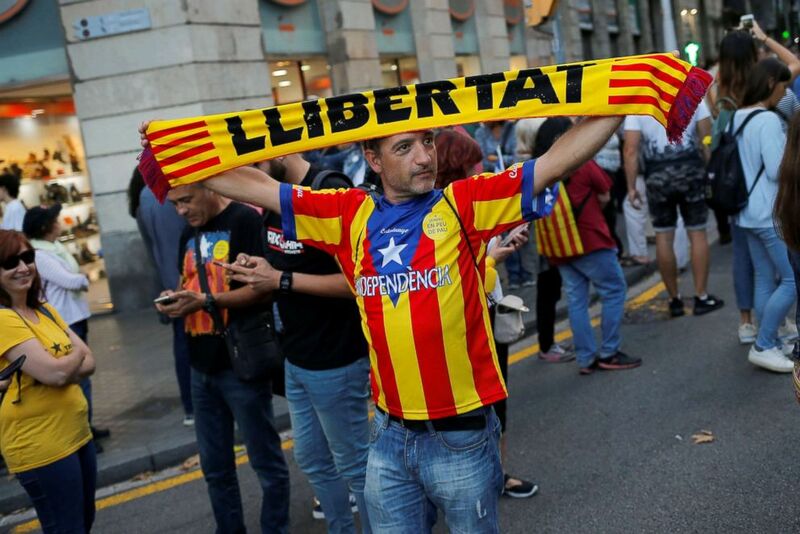 Such defiance burst out into the open again for Catalan’s national day Sept. 11 when hundreds of thousands of pro-independence demonstrators took to the streets of Barcelona to remind Spain and the world that they have not forgotten the referendum. "Last year, we did make it," Albert Marti, 39, told ABC News. Living in Munich where he works as an engineer, he traveled to Barcelona to vote on that special day last year. Marti said he believes that Catalans, mentally, are not ready yet to "stop all the institutions in order to take control of it." He added: "This is the only way we can implement our independence, with a real revolution." But not everyone favors full independence. After separatist politicians declared independence last year, the Spanish government of the conservative former Prime Minister Mariano Rajoy took control of the richest region of Spain by ousting the government of former Catalonia President Carles Puigdemont and prosecuting 25 Catalan leaders for rebellion. They are expected to remain in the region until Oct. 15, according to a police spokesperson. Fourteen people were injured and six were arrested after Spanish police clashed with separatist protesters. Meanwhile, activists Monday clocked a highway going to France and another one to Madrid. There were also protests in the streets of Barcelona, Sabadell and Lleida. "Barcelona has always defended that everyone can exercise their rights to free speech," Mayor Ada Colau told Catalunya Radio.